Originally created for Nuttelex Made with Coconut Oil - No Palm Oil, this cakes works with any Nuttelex spread. 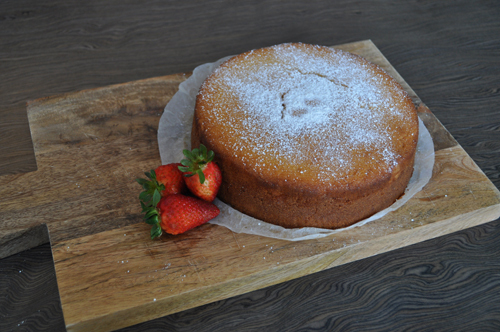 Served with tea this cake makes the ultimate afternoon indulgence, with just a light dusting of icing sugar. However, you can make it a little more fancy with the addition of a lemon drizzle icing sprinkled with shredded coconut or top with a thick buttercream style icing with lemon zest. 1Preheat the oven to 180C (160C Fan Forced) and grease and line your cake tin. 2Place the Nuttelex, sugar and vanilla extract into an electric mixer and mix on a medium speed until well combined. 3Add the eggs one at a time and mix on a slow speed until combined. Then add the flour, shredded coconut then milk and mix on slow again to bring it all together. Scrape down the bowl and give a final mix on a medium speed for 1 minute. 4Pour mixture into prepared tin and place in oven to bake for approximately 1 hour or until an inserted skewer comes out clean. 5Once baked remove from the oven and allow to stand in tin for 10 minutes before turning out on to a rack to cool. Dust with Icing sugar garnish with fruit of choice and serve.